Everyone talks about scent bringing back memories but this week it was a painting that triggered my recollection of a Guerlain classic. I’ve started renovating part of my house and this included taking out a built-in wardrobe. It was a typical nineties “Changing Rooms” style construction built of four-by-four and MDF, but what was hidden behind it really took me back. 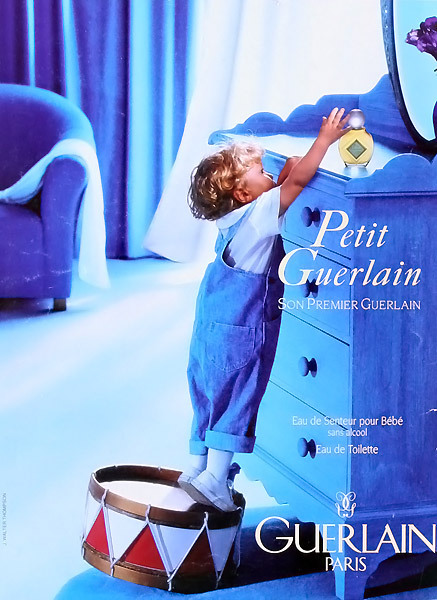 The wall was decorated with painted dolphins, so obviously it used to be a child’s room, and straight away I started to think about Petit Guerlain, which was released in 1994. So, let’s go back twenty two years and rediscover Guerlain’s innocence. 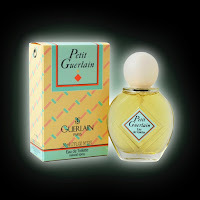 When Petit Guerlain was launched the public were unaware that it would be the last fragrance solely controlled by the family firm. 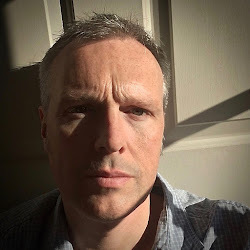 By the end of that year LVMH would have a majority share in the company and, ignoring Un Air de Samsara, there would be no new fragrance for two years. The Guerlain family finally sold their remaining stake to LVMH in 1996 and the new company's opening release was Champs-Elysées by Olivier Cresp. This first fragrance was unfortunately not very well received, especially when it became known that they had chosen Cresp's submission over Jean-Paul Guerlain’s. When Jean-Paul came up with the idea for Petit Guerlain in 1992, a fragrance for children, he enlisted the help of Olivia Giacobetti. By this point it had already been noticed that she was able to translate simple and fresh scents into engaging perfumes, and that was exactly what would be needed for Petit Guerlain. 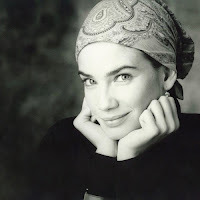 Olivia’s career has soared since that partnership, and it is clear that Jean-Paul’s faith was well placed. What was needed was a scent that would appeal to children, also the “young at heart”, and without a shadow of doubt that is exactly what they achieved. 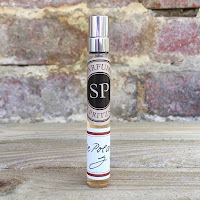 From the first spray you are immediately hit by a wonderfully soapy quality which seems to shout “bath time”, and for me it’s the combination of chamomile and violet leaf which gives that impression of innocence. You do have lavender in there as well but it’s so carefully proportioned that it doesn't intrude. The citrus notes are given plenty of space to breathe but it’s the bergamot which gives Petit Guerlain its edge, stopping it becoming yet another talcum powder outing. The floral heart of this fragrance is provided by mimosa, jasmine and rose, along with a delicate support from Guerlain’s tonka bean. It’s interesting that as the tonka starts to come through you do get a little powder, but just a slight dusting. It was released as an Eau de Toilette using 30% alcohol and packaged as “dermatologically tested”, but unfortunately it wouldn’t be given the chance the grow to adulthood. In 2014 LVMH released another fragrance called Petit Guerlain, but this was created by Thierry Wasser and was not related in any way to the original. Bottles of Jean-Paul’s version occasionally come up on auction sites and I would definitely recommend that you try to get your hands on a little bit of Guerlain’s lost innocence.